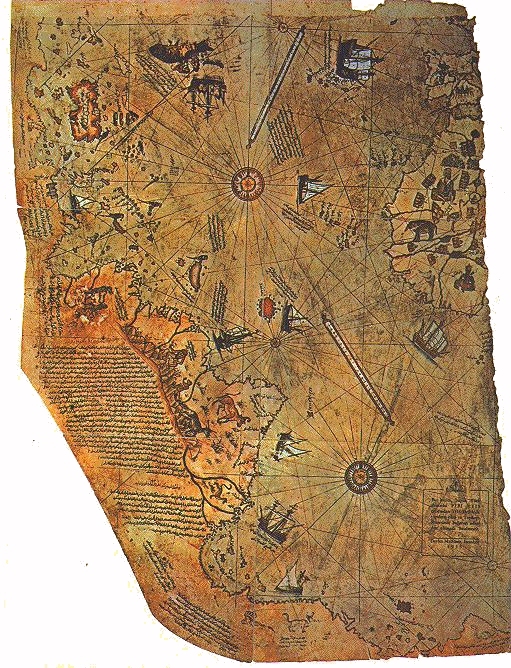 This map was drawn by Turkish Admiral Piri Reis in 1513. According to the legend on the surviving portion of the map, it was created using several older source maps. The big reddish island in the center of the map, between the mouth of the Amazon and the Coast of Africa, is right on the line of ancient sites, halfway between the Great Pyramid and Easter Island. There is no island in that location today. Charles Hapgood, Rand Flem Ath and Graham Hancock have suggested that the landmass in the lower right corner of the map is Antarctica. It has also been suggested that the landmass at the bottom of the map is a continuation of the South American coastline, curved to the right. The image below is a global equal azimuthal projection centered on Mohenjo Daro in the Indus Valley. Diagram of the Piri Reis map with latitudes and longitudes suggested by Charles Hapgood.